In sterilized soil, bluebunch grew the same regardless of the soil that was used. 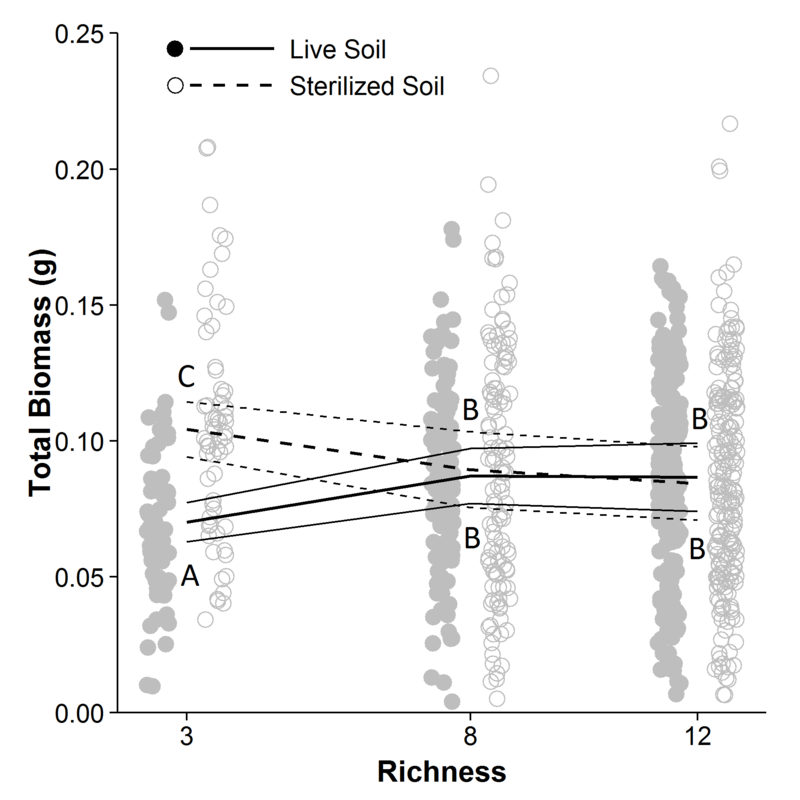 In unsterilized soil, bluebunch did not grow well in soil from the low-richness plots. Congratulations to Wenbo Luo for recently having a paper accepted to Ecology! In this paper, Wenbo shows that soil microbes inhibit the growth of related bluebunch wheatgrass plants (Pseudoroegneria spicata). To do this, he collected soil from bluebunch populations varying in their genetic diversity. He then grew bluebunch seedlings in that soil and compared their growth. Seedlings did not grow well in soil from populations with low genetic diversity. This effect went away when the soil was sterilized, suggesting that soil microorganisms were responsible. Soil feedbacks such as these are thought to result from adaptation by soil pathogens. Wenbo’s results suggest that soil pathogens specialize not only on species but on related individuals. This also provides a mechanism affecting the high productivity we see in genetically diverse bluebunch wheatgrass populations.